The flying prototype of Russia’s new Irkut MC-21-300 narrowbody airliner has completed the first stage of factory testing, OEM Irkut Corporation reports. The final, sixth flight as part of the first stage was performed on June 23. During the first phase the aircraft was tested for stability and controllability with different configurations of the wing high-lift devices, and with the landing gear retracted and deployed. The engines and onboard systems were also tested in various flight modes. 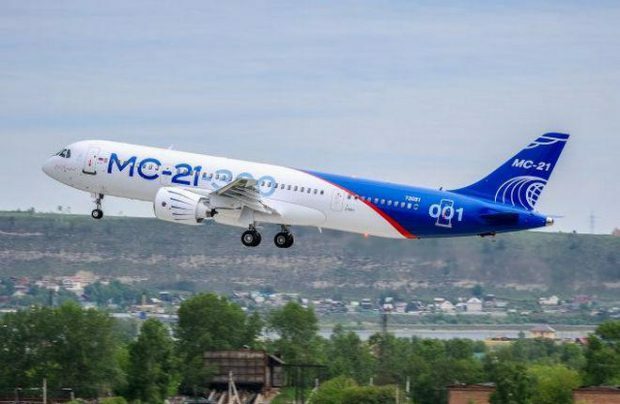 The MC-21 flight testing program was launched on May 28. The factory tests are expected to be completed by October. After that the airliner is to be ferried from Irkutsk to Zhukovsky outside Moscow for certification tests. The prototype currently in testing is powered by a pair of US Pratt&Whitney PW1400G geared turbofans. The aircraft is expected to be certified to Russian standards in 2019, to be followed by EASA certification in 2020. It is understood that the type will receive the Russian-made Aviadvigatel PD-14 powerplant as an engine option at some point later.